Los Angeles–Warnings that the H1N1 Swine Flu virus would mutate into a much more deadly strain have come true according to President Victor Yuschenko. The Ukrainian politician, vying for re-election, declared martial law last week in a move that reflects gross negligence and criminal malfeasance, according to intelligence sources provided by American public health expert, Dr. Leonard Horowitz. Worse, Yushchenko said nothing about cases of “Hemorrhagic Pneumonia” in the Ukraine that have WHO experts concerned they may be dealing with a combination of H1N1 and severe acute respiratory illness (SARS), or even Ebola genes in a new flu strain, creating a bloody global threat. “Yuschenko is skirting reports of ‘Hemorrhagic Pneumonia,’ the vaccine bioweapon predicted by Mosse to be released by Baxter, along with gross conflicting financial interests between news media outlets including Reuters and News Corp. and the top H1N1 vaccine suppliers,” Dr. Horowitz said. Horowitz has been warning people for months about these risky vaccinations producing deadlier recombinations. In April, as the first cases of “Mexican Swine Flu” were being reported, he posted a Special Report on YouTube explaining the emerging H1N1 pandemic as a “seeding” of the world’s population by British influenza chiefs Dr. James Robertson and Dr. John Wood on behalf of their conflicting interests in the drug cartel operating through the World Health Organization (WHO). More recently, Dr. Horowitz warned YouTube viewers that President Obama’s Declaration of National Emergency is, likewise, provably genocidal. Dr. Horowitz is known internationally as a vaccine prohibitionist and has defended himself against critics’ claims that he is “radical.” Over the years, with his many nightmarish predictions having come true, he charges his critics with being part of the problem. Obama and Yushchenko are both advancing this genocidal agenda. Both presidents criminally neglect the mystery surrounding Baxter’s culpability and vaccinations’ deadly past history. Both officials criminally neglect the obvious risk of H1N1 vaccines transmitting risky viruses as invitations to deadly mutations, such as what is occurring in the Ukraine. Both presidents rely on fraudulent claims of safety and efficacy of these vaccines. And both presidents neglect outrageous conflicting interests between the vaccine makers and mainstream news sources,” Dr. Horowitz says. What is happening in the Ukraine is essentially what is happening here in America. With Barack Obama’s H1N1 Declaration of a National Emergency, and with the US Military being deployed in cities to administer “mandatory” vaccinations, we are on the brink of martial law, featuring forced vaccinations and drugs as per the Model State Emergency Health Powers Act, all advancing as planned. Every pandemic in earth’s history has occurred synchronously with major socioeconomic and political upheaval. With the long expected, arguably planned, economic collapse, and now nearly 20 percent of the US population unemployed, a bigger deadlier picture emerges; a population control experiment relying on media persuasion and biological and chemical intoxications from vaccinations to protect the status quo and medical paradigm. As a co-formulator of a leading silver hydrosol, to make his point more clear, Dr. Horowitz insists his product not be purchased by anyone placing faith in the Food and Drug Administration (FDA) and drug industry, according to notices he has placed on the OxySilver website. 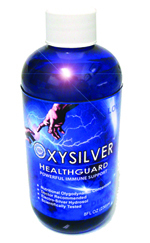 Reminder: Stock up on OxySilver Now Before the Mad Rush! We are grateful to David Dees for his great art!